How about something really different for your summer holiday? An island-hopping sea safari by dhow along the amazingly beautiful Quirimbas archipelago, a David Livingstone Bicentenary Birthday Safari in Malawi or a nine night self-drive through Namibia. A four-night island-hopping sea safari by dhow along the amazingly beautiful Quirimbas archipelago followed by three nights at Ibo Lodge on this historic island with its 16th-century fort. A lost world…. Pristine swimming and snorkelling in turquoise waters over untouched corals. Camping on a deserted, uninhabited island. Kayaks on board for short paddles. Fully catered, non-participation mobile camp with guide, chef and crew. Walks around Ibo Island which was once Mozambique’s mighty trading centre and has remained forgotten to the outside world for almost a century. Historical guided tours, interactive cultural and community projects, silversmith workshops, massages, and birding with a professional ornithologist. And this is just a brief overview of the myriad of activities available. Excellent value: from £2,785 per person for seven nights full board with internal transfers and international flights on a scheduled departure basis. Private departure on request. In David Livingstone’s time (it is the bicentenary of his birth this year), there were lions a-plenty and big game all around the huge lake that dominates this small rift-valley country. Livingstone recounts hunting buffalo here when he fancied a good rich steak. These days, of course, you have to leave that sort of hunting to the lions who have just been re-introduced to Majete Reserve in the south of the country. After years of predation and neglect, the return of the lions is a remarkable conservation success story for African Parks Network. Three nights at Mkulumadzi Lodge in Majete – a big-five reserve now, and a scenic one. A huge private concession within the park; boat safaris and walking too. Three nights at Mvuu Lodge on the Shire River in Liwonde National Park. Especially good elephant viewing in the dry season. Four nights at Pumulani on the shores of Lake Malawi, aptly named the Lake of Stars. Sandy beaches, crystal clear waters and behind in the forests baobabs and granite boulders begging to be climbed… irresistible for the young. From £3,730 per person in low season. One free night. Includes all flights. Namibia: lions in the dunes? Well, the chances of seeing lions in the dunes along Namibia’s skeleton coast are slim but it is possible! You can drive around this country if you have time on your hands, which will be the best value for money, or you can fly for speed and see even more incredible vistas from the sky. Achingly beautiful scenery: a photographer’s paradise. 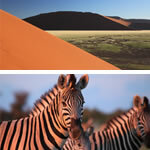 Sossusvlei for the highest sand dunes in the world: quad biking, hot air balloon rides. Damaraland for dramatic landscapes and desert-adapted elephant tracking plus rock art at Twyfelfontein. Star-gazing is seriously wonderful here with no light pollution. Etosha National Park for the best game-viewing in Namibia: rhino and more. A 9 night self-drive itinerary with Nissan X trails hire car and international flights costs from £2,690 per person. All itineraries subject to booking conditions and availability. Further details on request.